I grew up watching those 1980’s and early 90’s tough guy action movies. During that time, the action genre was immensely popular. For years those movies made one-man-armies and cheesy one-liners commonplace. But that doesn’t mean they weren’t fun and I wouldn’t hesitate calling some of them personal favorites. “Lockout” takes a lot of its inspiration from those 80’s action flicks and it unashamedly tries to recreate the tone and feel of those films. Because of that, the movie could be an immediate turn-off for those who didn’t care for the genre or a disappointment for those who don’t get what the film is aiming for. I found it to be a fun piece of popcorn entertainment despite its few noticable shortcomings. “Lockout” doesn’t pretend to be earth-shattering or ground-breaking by any means. It’s very straightforward in its presentation and even the trailer seemed patterned after those from the 80’s. Several elements of the story are fairly familiar but with a futuristic, sci-fi angle. Guy Pearce bulks up to play a government operative named Snow. He’s an irreverent, wise-cracking loose cannon who finds himself framed for a crime he didn’t commit (stop me if you’ve heard this before). Meanwhile Emilie Warnock (Maggie Grace), the U.S. President’s daughter, is visiting an orbital space prison known as MS ONE on a humanitarian fact-finding mission. But while there, the prisoners revolt and take charge of the space station. Snow is asked to go in and rescue the President’s daughter in exchange for his freedom. Of course he agrees but with his own ulterior motives. The story moves at a pretty fluid pace and at 95 minutes it’s pretty compact and doesn’t drag things out. In many ways Snow is your prototypical tough-guy. He’s tough as nails, has a bad attitude, and fires off more one-liners than bullets. Clearly he’s written to take wise-cracking to the extreme but it’s a little overdone. In fact, it’s almost as if Snow is completely incapable of carrying on a normal conversation. One the flip side, this isn’t a movie centered around stimulating conversation and several of Snow’s quips are quite funny. But it also makes him an incredibly one-dimensional character. The movie is chock full of CGI and special effects. Some of the effects are well done and they do a lot to create a believable sci-fi environment. But there are also several examples where they look more like a video game than a movie. Before the movie started, the trailer for Ridley Scott’s “Prometheus” was shown and the difference in the special effects between the two is staggering. But to be fair, “Prometheus” has about five times the budget and “Lockout” just tried to make due with what it had. The action scenes are pretty well done even though so much of it happens off-screen. This was clearly done in order to obtain a PG-13 rating. But in a way it subverts the tough and gritty look of the film and takes away an edge that would have made the movie better in my opinion. I’m a big fan of Guy Pearce. When it comes to movie roles he has a pretty diverse resume, but I haven’t seen him play a character quite like this. It doesn’t take long to figure out his approach to Snow. Pearce is clearly having fun with the role and his performance is quite good. I never felt Pearce let’s Snow become just a caricature and in several instances he elevates the material. Maggie Grace does a decent job although she’s not quite on Pearce’s level. The movie is helped by some really good smaller supporting performances. It’s funny to say about this type of movie, but the acting really rises above the story in many places. 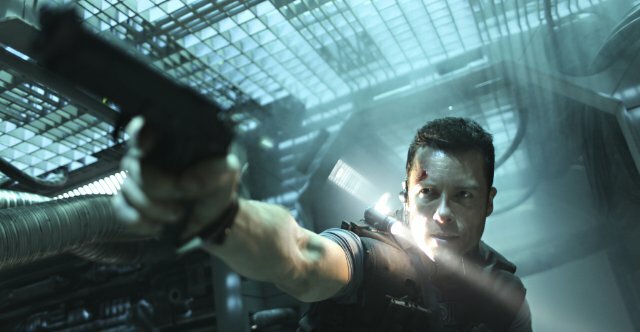 “Lockout” is getting hammered by critics and I find that to be no surprise. This is another example of some critics not measuring the film by what its trying to be. Now I’m not saying “Lockout” is incredible filmmaking or a new classic. It clearly has it’s issues that do drag it down a bit. The special effects aren’t the best and the action is sometimes pruned to the point of being ineffective. But I still found it to be an entertaining sci-fi B movie led by a really, really fun performance from Pearce. 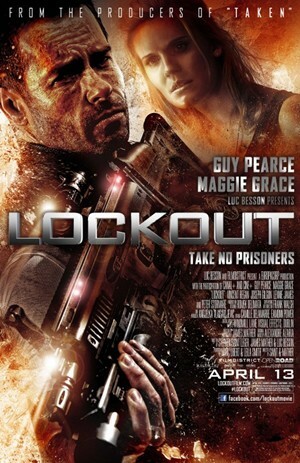 “Lockout” won’t win any awards but for the most part it accomplishes what it intends to. This entry was posted in Movie Reviews - L and tagged 80's action movie, b movie, guy pearce, maggie grace, movie review, sci-fi. Bookmark the permalink. Really liked the sound of this. Then got the feeling from the trailer that they were overdoing the one-liners. Interesting though. Pearce can be great but I suspect you’re right and this should have been a bit more adult. Shame they went for a lower rating. Great review, sounds like a decent enough film. Ya know, I struggled with the 3 or 3 1/2 star rating and I still may go back and drop it. I like what they’re doing and it’s effective to a degree. But it certainly has it’s flaws and their choice of one-liners instead of character development didn’t really work. Pearce is really fun to watch though and at times it does feel like those 80’s action flicks I grew up watching. This does have the vibe of an 80s action flick and that’s not necessarily a bad thing. I do like Guy Pearce and seems like he’s trying on the action hero role the way Liam Neeson did, but we’ll see if he’d be as successful. Maggie Grace however is a terrible actress, she looks as bad in the trailer as she was in Taken! “This is another example of some critics not measuring the film by what its trying to be.” Interesting point, sometimes they do take things way too seriously. “Lockout” certainly isn’t great. But it’s pretty fun and sometimes I think critics miss that because they are looking for something that the filmmakers aren’t even trying for. That said, I do understand critics noticing flaws in a film and this one does have some. I can see a little of Snake in Guy Pearce’s Snow character. But Snow is a little more easy going than Snake. And even Snake didn’t launch as many one-liners as you will find in “Lockout”. But again that’s not all bad. The movie intends to be over-the-top with it and in many ways I saw it as an hommage of sorts. In fact, it has inspired an upcoming “Phenomenal 5” that I’m having some fun with. Thanks for checking out the review. Saw your page – VERY nice.